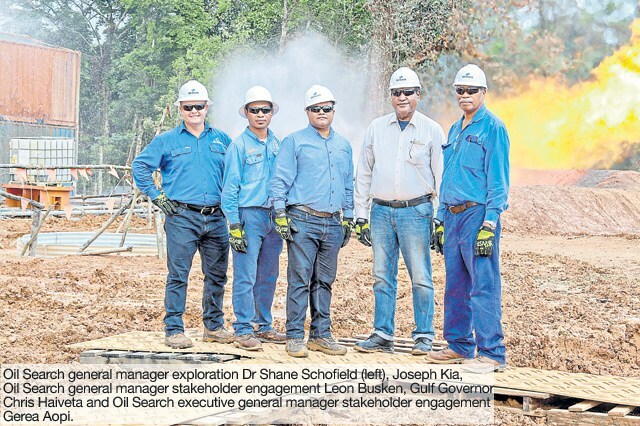 Oil Search and its joint venture partner Kumul Petroleum Holdings Ltd have successfully tested gas at Kimu 2 in Petroleum Retention Licence (PRL) 08. The field, first discovered by Oil Search and partners in 1999, straddles Western and Gulf provinces. Shares in the well are held by affiliates of Oil Search (83 per cent) and Kumul Gas Niugini, 17 percent. According to Oil Search, Kimu 2 was spud on April 22 this year and reached a total depth of 1943 metres last month. Evaluation of the well data acquired has now commenced and will be used to help assess options for the potential commercialisation of the Kimu Field. The drill stem test was conducted on Wednesday and witnessed by a delegation comprising Gulf Governor Chris Haiveta, and representatives of Kumul Petroleum and Oil Search. Haiveta thanked Oil Search as the operator of the well for inviting him to the site to witness the test. He said the province would support Oil Search and Kumul Petroleum Holdings Ltd drill more wells.